On June 6, 1944, at approximately 7:15 A.M., only 45 minutes after the initial allied landing craft hit the beaches of Normandy, France, to breach Hitler's Atlantic Wall, 1st Lt. Bob Edlin and the men of 1st Platoon, A Company, 2nd Ranger Battalion approached the smoke-shrouded Dog Green Sector of Omaha Beach in their LCA (Landing Craft Assault). Both A and B Companies' landing craft had spent the early hours of the morning trolling in a circling pattern a few miles off the coast of France awaiting orders to land. Those orders had now arrived. Into the Jaws of Death-U.S. Troops Wading through Water and Nazi Gunfire. 6 June 1944. 2,963 x 2,385 pixels. On June 6, 1944, at approximately 7:15 A.M., only 45 minutes after the initial allied landing craft hit the beaches of Normandy, France, to breach Hitler's Atlantic Wall, 1st Lt. Bob Edlin and the men of 1st Platoon, A Company, 2nd Ranger Battalion approached the smoke-shrouded Dog Green Sector of Omaha Beach in their LCA (Landing Craft Assault).1 Both A and B Companies' landing craft had spent the early hours of the morning trolling in a circling pattern a few miles off the coast of France awaiting orders to land. Those orders had now arrived. The time aboard the small LCA in rough seas took its toll on the Rangers. Lt. Edlin recalled: "There were many sick people. They were vomiting on each other's feet and on their clothing. "2 They had been told to expect minimal resistance. The massive thirty-minute naval bombardment, accompanied, as historian Stephen E. Ambrose explained, by "480 B-24s carrying 1,285 tons of bombs,"3 was intended to annihilate German resistance on Omaha Beach and create shell holes to provide the advancing Americans cover. The bombardment, however, accomplished very little. An LCA beside Lt. Edlin's carrying men of B Company exploded from a direct hit, likely killing everyone aboard before they could even hit the beach. Edlin's LCA struck a sandbar and ground to a halt 75 yards off the beach, but the ramp did not drop because the British seaman tasked with operating it had been decapitated by the intense hail of incoming German fire.5 Edlin screamed at the British coxswain to get the boat in further so his men would not have to cross such a vast expanse of beach, 75 yards of at least shoulder deep water followed by roughly 200 more yards of sand,6 under withering fire, but the coxswain refused to go any further. Exasperated, Edlin moved the decapitated sailor aside to operate the ramp on the front of the craft.7 Lt. Edlin and his fellow Rangers prepared to surge forward into the maelstrom of death and destruction that was Omaha Beach. A reported 4,720 Americans died on Omaha Beach.8 A great many of these casualties can be attributed to failures from those at the top entrusted with the planning of the attack. Be it the failure of pre-invasion tactics, an improper understanding of the conditions the men would be entering, or the introduction of inappropriate men and machinery, none of the expected advantages actually materialized on the French beaches. In spite of all of these failures from the top, the men on Omaha Beach accomplished their objective. As the dawn broke then next day, although casualties covered the beach, the sunrise shone brightly on American flags as well. The victory was won not through brilliant military strategy from the top, but on the battlefield – through bravery and poise exhibited by men at the bottom. It was the ability of officers on the ground, officers like Colonel Schneider, Lt. Edlin, Lt. Spaulding, and Capt. Dawson, to adjust to the disadvantages they found on the battlefield and to persevere through the endless challenges they faced on June 6, and through their perseverance they encouraged others who witnessed their resolve. It was their ability, bravery, resolve and self-control that found triumph in the face of defeat. Though failures made from the top prior to June 6th resulted in a great loss of life on Omaha Beach, the valor and composure of those on the ground proved great enough to persevere and win the day, beginning their road to Berlin. United Kingdom prime minister Sir Winston Churchill expressed in his memoirs his skepticism of the brash American plans: "While I was always willing to join with the United States in a direct assault across the Channel on the German sea front in France, I was not convinced that this was the only way to win the war, and I knew that it would be a very heavy and hazardous adventure. "14 The horrible casualties associated with the frontal assaults of World War I remained fresh in the minds of Englishmen like Churchill. Two landing areas were considered by COSSAC as sites for the Allied invasion of northwest France. The first was the Pas de Calais, the narrowest point in the channel and the most obvious tactical and logistical place to attack German-occupied France. But the Pas de Calais, because of its position as the prime invasion location, was "the most strongly defended area on the whole French coast,"15 according to General Morgan and COSSAC. Because of the tremendous defenses put in place at the Pas de Calais by Field Marshal Erwin Rommel, commander of the German Army Group B, and by the German Commander in Chief of Western Operations, Field Marshal Gerd von Rundstedt,16 COSSAC suggested that the second invasion site be used. This site was Normandy. Normandy was less heavily defended than the Pas de Calais for a reason. The English Channel was much wider at Normandy. Normandy was also further southwest, placing it further from Germany. A third problem with Normandy was that it had only one port, located at Cherbourg, large enough to support Allied logistical needs.17 Nevertheless, Normandy was chosen by COSSAC on the belief that, despite geographical and logistical issues, it held a much higher chance of success than the Pas de Calais. This decision gained approval by the Allied Supreme Command, and British backing was achieved from Field Marshal Bernard Montgomery, the "operational command of [Allied] ground forces for the invasion of Europe," after Montgomery made some significant changes to the invasion plan.18 He proposed a larger invasion front with more landing zones, the abandonment of the invasion of southern France (codenamed Operation Anvil), and the use of Airborne forces prior to the amphibious assault on Hitler's Atlantic Wall. Eisenhower supported Montgomery's proposal.19 The plan was named Overlord, and the invasion date, D-Day, set for June 5, 1944, later pushed back to June 6 due to bad weather conditions. H-Hour, the time of the landings, would be 6:30 a.m. The United States was assigned two beaches on the western end of the invasion site where American forces would, it was anticipated, quickly secure the vital port of Cherbourg. One of them, initially codenamed Beach 313, was not ideal. It was a roughly four-mile, crescent-shaped beach. The high water mark could vary by as much as 600 yards from low to high tide. The plans were in place, but even the best of plans can go awry, and the operation was far from ideal. Nevertheless, in the early morning hours of June 6, young soldiers of the 29th and 1st Infantry Divisions boarded assault craft in rough waters. Predawn light illuminated their approach as a massive—yet, as it turned out, hugely-ineffective—bombardment crashed down on German-occupied France. Fear and uncertainty filled the Allied general staff who had planned the invasion. They had been like gods, assigning the movements and tasks of thousands of Allied forces. But now they were helpless. The fate of the war, and very well the world, was held in the hands of a group of young men who crouched wet, miserable, scared, and uncertain in their landing craft that slowly lumbered through white-capped waves toward a smoke-shrouded beach. Widerstansnesten (resistance nest) 62 was one of the main defensive fortifications on Dog Green sector of Omaha Beach. Its job was to protect the vital paved road of the Vierville Draw. After the initial bombardment, German soldiers of the 352nd Division rushed to prepared defensive positions along the bluffs overlooking Omaha Beach. What they saw shocked them: allied landing craft coming directly for them. "They must be crazy," Sergeant Krone declared. "Are they going to swim ashore? Right under our muzzles? "29 The Germans received orders to hold their fire until the Americans reached the waterline. There the slaughter would ensue. An unknown Navy Lieutenant recognized the flaws of the DD tanks and, disobeying orders, commanded his LCTs to take the 743rd Tank Battalion all the way to the beach instead of following the plan. Seven of his eight LCTs made it to the beach, bringing 28 much-needed tanks to the 29th Infantry's aid.39 These tanks accounted for the vast majority of tanks that made it to the beach at all. The firepower they gave and the lives they saved cannot be measured, although the fact that they came in first without the infantry allowed the Germans to concentrate their fire on them for a time and reduced the tanks' effectiveness. This caused engineers to be in one place on the beach and tanks at another. The few DD tanks that made it to the beach could not make it through the obstacle belt because they did not land with combat engineers. In short, planners ignored the ability of the current to cause landing craft and DD tanks to miss landing objectives. If the engineers, infantry, and tanks all landed on the same type craft, they might not have landed on target, but they would have landed together, which is the most important consideration. As A Company landed at 6:30 A.M., exactly on time, the German positions along the bluff remained menacingly quiet. Captain Fellers, the commanding officer of A Company, and his men began to advance up the beach through the rising surf along with the two DD tanks that had made it to Dog Green. As they progressed up the beach, the Germans opened fire with MG- 42 machine guns, mortars, rifles, and artillery fire. The men of A Company had never experienced combat, and their baptism of fire was an unfair and swift slaughter. Every single man of the thirty-one in Sub-Lieutenant Green's LCA including Captain Fellers died in the wall of death that rained down on A Company. Of the 155 men of A company, 100 died in those opening minutes. Most of the others fell wounded.41 If other boats had landed on target with a more effective barrage from the Navy and Air Corps and tanks in a higher concentration with supporting combat engineers in the same place, far fewer casualties would have been sustained. As historian Joseph Balkoski stated so well, "The men of Bedford had trained for almost three and a half years for this moment, only to be cut down in seconds like stalks of wheat felled by a scythe. "44 Their training failed to prepare them to move forward into enemy fire, something that many combat veterans learned by necessity. Instead, most of the men sought ineffective cover or fell back into deeper water to hide. The recognition, by officers and enlisted alike, that the beach offered no cover—despite the false security of beach obstacles and destroyed tanks or landing craft—saved many of the 1st Infantry Division's soldiers who hit Omaha Beach. Most were experienced combat soldiers who served in North Africa and Sicily before being tapped for the invasion of Normandy. Unlike the 29th Infantry, they were not crippled by the hail of incoming fire, saving many of their lives. Despite some men, mostly 1st Infantry, making it up the beach and to the sea wall or shingle that provided temporary cover, there seemed to be too few to take the German-held bluffs ahead. The surviving men who stayed on the beach were slowly being wiped out, and those at the shingle or sea wall clung to their bit of cover as German mortars began to attempt to neutralize this cover as well. Here and there, groups of enlisted and noncommissioned officers and maybe a junior officer decided they must push on, for that was their only chance to live. By this time, it was roughly 7:00 A.M., thirty minutes after the first wave landed. The subsequent waves would soon begin to hit the beaches at around 7:15 A.M. In small groups, men of the 1st Infantry on the left flank began to push up the beach and toward the bluffs through murderous fire and horrendous casualties. The situation for the 29th, particularly on Dog Green with the few survivors of A Company, was dire. The only way out of the jaws of death would be to go straight into the monster itself. In an attempt to salvage the quandary on Dog Green, the 5th Rangers and two companies of the 2nd Rangers, the elite of the U.S. Army, were diverted from their original position to Dog Green to aid in the efforts there when they did not receive the code words to land on Point Du Hoc.48 The two companies of the 2nd Rangers and Lt. Bob Edlin found themselves landing in the killing fields of Dog Green sector. They waded through the shoulder-deep cold water of the English Channel amid enemy fire as the lifeless bodies of their comrades floated by, face down. Somehow, they made it to the water's edge where the dejected soldiers of the 116th Regiment clung to life, utterly defeated. Edlin urged them forward, but to no avail. The Rangers rushed across the beach, hell-bent on completing the objective. Men all around Lt. Edlin were gunned down. To the left of the 2nd Rangers, the 5th Rangers landed on Dog White. They were supposed to land on Dog Green, but their veteran commanding officer Colonel Max Schneider saw the slaughter on Dog Green and the heavy smoke on Dog White caused by a burning LST or LCT and the relatively safe situation on Dog Red.51 He knew that this smoke screen would provide his men cover as they advanced on the less heavily defended beach. Then they could flank the heavy defenses of the Vierville Draw. The value of a combat-experienced commanding officer was demonstrated, and many lives were saved. Meanwhile, the 1st Infantry, spearheaded by Lt. Spaulding, Capt. Joe Dawson, and Capt. Robert Walker, was pushing its way up the bluff and taking the various strategic draws in the 1st Infantry's area of operations.54 Slowly but surely, Omaha Beach was being secured. Hitler's Atlantic Wall had been breached. By day's end, that Wall had been toppled. U.S. forces secured a vital toehold on Omaha Beach from which they could launch operations to break out of Normandy and start on the long road to Berlin. The Allied victory throughout Normandy spelled the beginning of the end for Germany in World War II. Despite the eventual success of the operation, the pre-invasion bombardment proved to be completely ineffective. The way in which the tanks, engineers, and infantry arrived on the battleground separately diluted combat effectiveness. The planners did not account for strong cross-current conditions. U.S. landing craft operators were poorly trained to get troops to the correct location through swirling currents. Inexperienced National Guardsmen were asked to do a job that should have been assigned to hardened veterans. Amphibious DD tanks were a complete disaster when implemented the way planners intended. When so much went so terribly wrong, how did the battle for Omaha Beach not end with the Germans holding the heights as the sun set over France on the night of June 6, 1944? The 4,720 casualties on Omaha Beach were staggering, but if it had not been for the ability of officers to adapt to the changing situation on the battlefield and seize the initiative like Colonel Schneider or the unknown Navy Lieutenant and the ability of small groups of young men to never quit like Lt. Edlin's men or Lt. Spaulding and Capt. Dawson, the operation to seize Omaha Beach might have been an utter failure.55 At the very least, the casualty numbers would have been even higher. There are surely countless unsung heroes of Omaha Beach whose names and deeds of valor and self-sacrifice are lost to the annals of history. We are forever indebted to them, the named and unnamed, the living and the dead, and we must not forget what they did. Their reasons for fighting so courageously varied. Some fought for the ideal of freedom and nationalism, others for their families back home, but most say they fought for the man next to them. It was simple: they did not want to let their buddies down. Though they varied in preparedness, the courage of each and every man who set foot on the killing fields of Omaha Beach should never be questioned, for so many of them did lay down their lives on that lonely stretch of beach so that others might live. Tyler Abt, Virginia Tech class of 2015, developed this paper in Professor Peter Wallenstein's class in Historical Methods in the fall of his sophomore year. Published in memoriam. Adams, Jay S. Interview by Tom Swope. Painesville, OH, July 5, 2001. Beazley, Jesse A. Reminiscing on World War II experiences. January 13, 2004. Bradley, Omar N. A Soldier's Story. Scranton, PA: The Haddon Craftsmen, 1951. Garman, Gale E. Interview by Jordan Bowling. Dayton, OH, November 14, 2005. Delaney, Kenneth T. Reminiscing on World War II experiences. Undated. Giangreco, D.M., with Kathryn Moore. 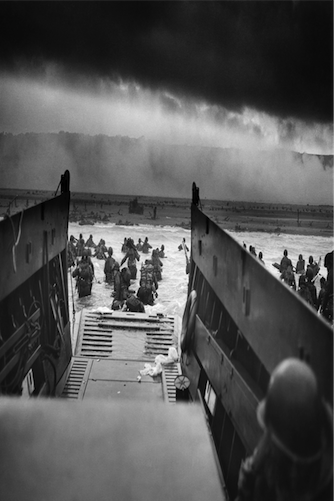 Eyewitness D-Day: Firsthand Accounts from the Landings at Normandy to the Liberation of Paris. New York: Sterling Publishing Co, 2005. Library of Congress: Veterans History Project. While a potentially useful source, the lack of the exact unit that each veteran was in and the time they landed vastly limited the usefulness of almost all interviews for my purpose. Loncaric, William V. Interview with William S. Switzer. Undated. Marcia, Moen, and Margo Heinen. The Fool Lieutenant: A Personal Account of D-Day and World War II. Elk River, MN: Meadowlark Publishing, 2000. Woodring, Claud C. Interview by Andrew Fisher. January 2, 2003. Ambrose, Stephen E. D-Day: June 6, 1944, The Climactic Battle of World War II. New York: Touchstone, 1994. Astor, Gerald. The Voices of D-Day. New York: Dell Publishing, 1994. Balkoski, Joseph. Beyond the Beachhead: The 29th Infantry Division in Normandy. Mechanicsburg, PA: Stackpole Books, 1989. Balkoski, Joseph. Omaha Beach: D-Day June 6, 1944. Mechanicsburg, PA: Stackpole Books, 2004. Balkoski's work is the absolute best book on Omaha Beach. It is written in a hybrid style with narrative by Balkoski and quotes only coming in usually long block form. Kershaw, Alex. The Bedford Boys: One American Town's Ultimate D-Day Sacrifice. Cambridge, MA: Da Capo Press, 2003. Lewis, Adrian R. Omaha Beach: A Flawed Victory. Chapel Hill: University of North Carolina Press, 2001. Though I disagree with many of Lewis's views, he is a needed and thought provoking voice in the muddle of patriotic cheerleading that makes up the bulk of historical writings about Omaha Beach. Pogue, Forrest C. George C. Marshall: Organizer of Victory. New York: Viking Press, 1973. Ryan, Cornelius. The Longest Day: June 6, 1944. New York: Touchstone, 1959. 1 Joseph Balkoski, Omaha Beach: D-Day June 6, 1944 (Mechanicsburg, PA: Stackpole Books, 2004), 158. 2 Marcia Moen and Margo Heinen, The Fool Lieutenant: A Personal Account of D-Day and World War II (Elk River, MN: Meadowlark Publishing 2000), 27. 3 Stephen E. Ambrose, D-Day: June 6, 1944, The Climactic Battle of World War II (New York: Touchstone, 1994), 120. 4 Moen and Heinen, The Fool Lieutenant, 27. 6 Balkoski, Omaha Beach, 158. 7 Moen and Heinen, The Fool Lieutenant, 28. 8 Balkoski, Omaha Beach 352. 9 Omar N. Bradley, A Soldier's Story (Scranton, PA: The Haddon Craftsmen, 1951), 197. 10 Bradley, A Soldier's Story, 198. 11 Bradley, A Soldier's Story, 201; Balkoski, Omaha Beach, 6; Forrest C. Pogue, George C. Marshall: Organizer of Victory (New York: The Viking Press, 1973), 329. 12 Bradley, A Soldier's Story, 196. 13 Balkoski, Omaha Beach, 6. 17 Balkoski, Omaha Beach, 10. 18 Adrian R. Lewis, Omaha Beach: A Flawed Victory (Chapel Hill: University of North Carolina Press, 2001), 125. 19 Lewis, Omaha Beach, 126-130. 20 Cornelius Ryan, The Longest Day: June 6, 1944 (New York: Touchstone, 1959), 187. 22 Ambrose, D-Day , 320. 23 Balkoski, Omaha Beach, 11. 24 Ambrose, D-Day , 121. 26 Gerald Astor, June 6, 1944: The Voices of D-Day (New York: Dell Publishing, 1994), 223. 33 Alex Kershaw, The Bedford Boys: One American Town's Ultimate D-Day Sacrifice (Cambridge, MA: Da Capo Press, 2003) 127. 34 Balkoski, Omaha Beach, 96. 36 Impact fuses were chosen because Allied planners wanted to limit cratering the beaches, which after all would function as artificial ports for landing more forces and supporting the massive logistical needs of the invasion force. Impact fuses do not have the penetrating power to destroy sturdy concrete fortifications such as those on the bluffs overlooking Omaha Beach. Delay fuses will penetrate their target before detonating, causing massive damage to a fortification such as a bunker. Today's "bunker buster" bombs function on the principle of a delayed fuse. For a detailed chart of the bombing plan of Omaha Beach see Joseph Balkoski's Omaha Beach, 77. 37 Ryan, The Longest Day, 205-6. 38 Balkoski, Omaha Beach, 102. The historian Adrian R. Lewis makes a similar argument in his book Omaha Beach: A Flawed Victory, although he argues that United States forces should have dropped off their DD tanks from their LCTs closer to shore like the British did where pre-invasion studies had shown a much higher success rate for DD tanks getting to the shoreline. 39 Joseph Balkoski, Beyond the Beachhead: The 29th Infantry Division in Normandy (Mechanicsburg, PA: Stackpole Books, 1989), 129. 40 Balkoski, Omaha Beach, 148. 41 Balkoski, Omaha Beach, 121. 42 Balkoski, Omaha Beach, 121. 43 Kershaw, The Bedford Boys, 130-131. 44 Balkoski, Omaha Beach, 123. 45 The argument of having two combat-experienced divisions was first proposed in detail by historian Adrian R. Lewis in Omaha Beach: A Flawed Victory, though he does not make the same distinction that I do between regular and National Guard units. 46 Balkoski, Omaha Beach, 137. 48 Moen and Heinen, The Fool Lieutenant, 27. 49 Moen and Heinen, The Fool Lieutenant, 28, 90-91. 50 Moen and Heinen, The Fool Lieutenant, 91-93. 51 Moen and Heinen, The Fool Lieutenant, 93; Ambrose, D-Day, 427. 53 Balkoski, Omaha Beach, 236. 55 Balkoski, Omaha Beach, 352.